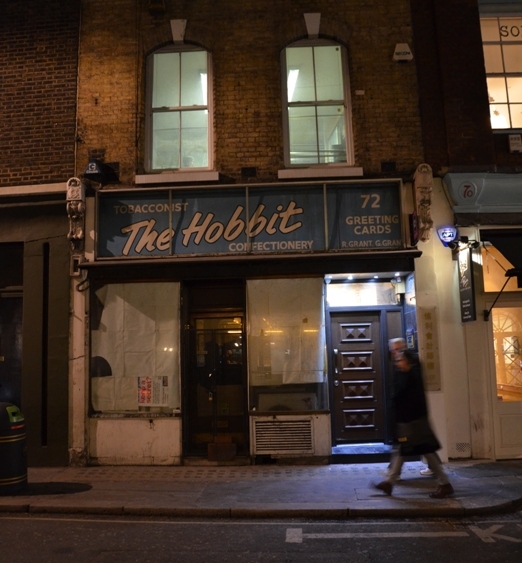 At 72 Wardour Street in Soho, there’s a newsagent which goes by the unusual name of The Hobbit. Or, at least, there used to be. The newsagent was given the name in the early 1970s, simply because the owner Ray Grant was a fan of the book (his name can be seen on the right of the sign.) Run by manager Victor for most of its lifespan, the shop was an old-fashioned newsagent in the heart of Soho, and when I recall its dusty, faded, strangely East German-looking interior, I could kick myself for never taking photos. 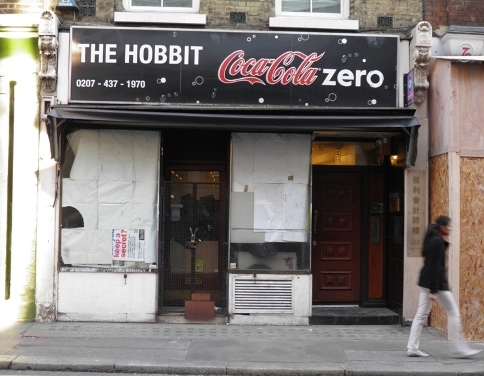 The largely unmodernised shop was sold to new owners in 2007, who gutted, refurbished and turned it into something closer to a late-night mini-mart. 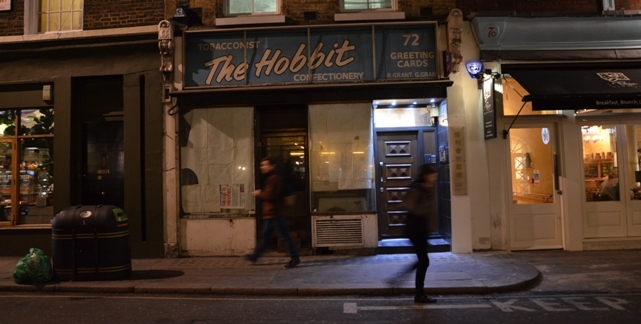 They retained a later sign which had been erected by Ray Grant, but while the new owners diligently chiselled his name off the front, they left The Hobbit. The name looks even odder when you see it on the modern sign – it seems to bear absolutely no relation to the other words, or the building its on, or any sort of possible business. 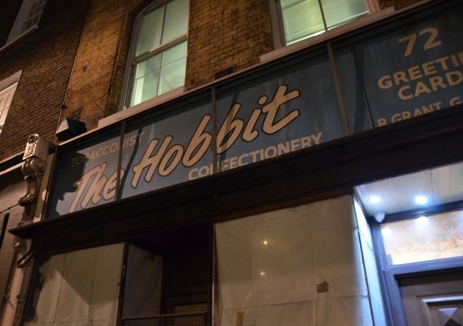 The shop closed down in late 2011 and after being empty for six months, the modern sign was removed to reveal the original 1970s frontage in all of its handpainted glory. I think part of the joy of seeing the sign again is that it’s a reminder of how shop fronts used to look. Inviting, quietly attractive examples of the human sign-writer’s art. They’re not like the majority of newsagent’s signs today, which are uniformly awful: looming, back-lit slabs which people with no design experience have drawn up on a PC, squashed into shape and had printed on sheets of neon plastic. So far the 1970s sign has enjoyed six unexpected months in the open air – but how much longer it will stay there is anyone’s guess.